I've just installed a copy of OSX Snow Leopard onto my MacBook Pro and its running fantastically, it has also free'd up 6GB of hard disk space over Leopard, I assume mainly due to the fact that Snow Leopard doesn't have to support legacy code for PowerPC like Leopard does. The UI doesn't seem to have changed a massive amount though as most of the changes are under the hood with new technologies such as OpenCL and Grand Central Dispatch. Its actually a really good book and so far has carried over a lot of the information I have learnt from the OU about the Java language and expanded on Objective C specific details. I'm only a few hundred pages deep so far but I am thoroughly enjoying it and getting a chance to test out code in the X-Code IDE. The book is geared predominantly at the languages and not the graphical side of OSX in the form of Cocoa, for that I will need another book which I will buy in due course. My ultimate goal is to do some iPhone development and my first project is going to be an application to post blogs and photo's onto blogger. It is going to take some time as I am having to fit all this around my studies but if it goes well it may be something I will try and pursue for the computing project M450 with the OU (if they let me that is). It will also allow me to keep programming whilst I'm studying courses which are more theory and less coding based such as M256 and other level 3 courses. Apparently it is good to learn a new programming language every year! I'll guess i'll find out whether this is true or not in the not too distant future! 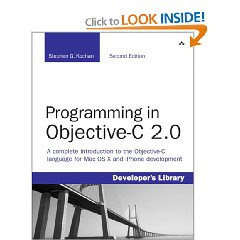 I bought the same book to learn Objective-C but am not going to read it until after starting M255 in two weeks time. Glad to hear that you're finding learning Objective-C easier thanks to M255!